JURY’S COMMENTS: Mesmerizing and deep, The Temple for Hilma presents a wonderful way of experiencing Hilma af Klint, each visitor being led on a journey within the museum. The idea of displaying the art in specific and color-coordinated spaces promises to be truly immersive and unique, and shows an understanding of and connection with af Klints work and movement. Layout, building, storytelling and how you move through the influences of her work and life make this project stand out. 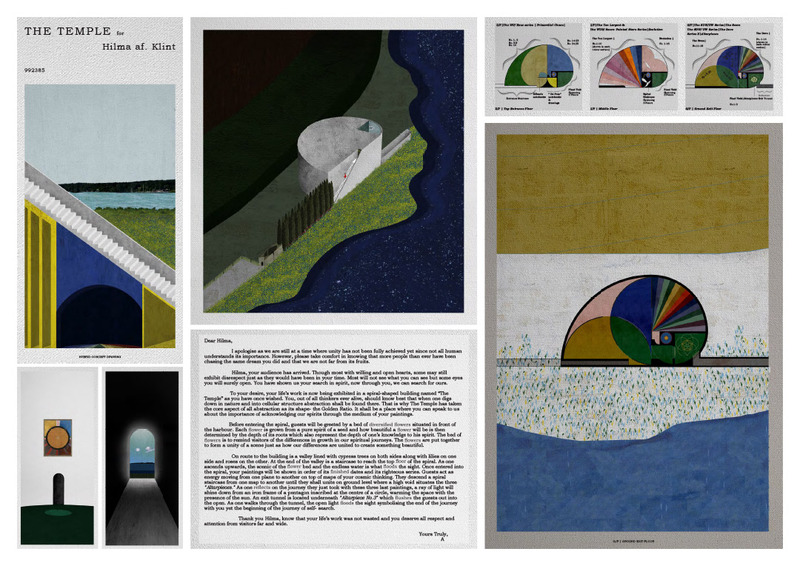 The presentation is beautifully illustrated with a painterly/graphical language, and the well-written text brings yet another dimension to the proposal by highlighting the spiritual aspects of af Klint’s life and further visualizing the visitor trajectory. Rather than simply providing space for her art, The Temple strives to be a part of the experience, seeking to convey af Klint’s ambience to each visitor in a physical way. Overall, the project is quite dearing and seducing, just like Hilma af Klint’s art.